Ryan O'Byrne will be participating in the Canadiens' rookie camp, beginning Sept. 7. MONTREAL - Canadiens GM Bob Gainey announced Wednesday the signing of defenseman Ryan O'Byrne to a two-year contract. As per club policy, financial terms of the deal are not disclosed. 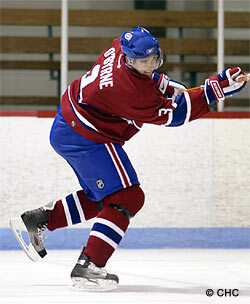 Selected by the Canadiens in the third round (79th overall) in 2003, O'Byrne, a native of Victoria, British Columbia, completed his third season with the Big Red of Cornell University, in the Eastern College Atlantic Conference (ECAC) in 2005-06. In 28 games, the 6-foot-5, 234-pound blueliner scored seven goals and added six assists (7-6-13), both career highs, and totalled 69 penalty minutes. O'Byrne, 22, played in 92 games in three seasons with the Big Red, totalling 10 goals and 15 assists (10-15-25), as well as 208 penalty minutes. He will participate in the Canadiens' rookie camp starting on September 7.